Can you think of a word that means one thing and its exact opposite, depending on the context in which it is used? Pity foreigners learning English who try to understand the word “quite”. Sometimes “quite” means a bit, but not very. If a meal is “quite good,” it is only all right. If a dress is “quite cheap,” it is not a bargain. At other times, “quite” means extremely. If you say you are “quite sure,” you mean you are absolutely certain. If the opera was “quite superb,” that is a superlative, not a qualification. And if you are asked if you are “quite satisfied,” the questioner wants to know if you are completely happy. So “quite” means two, er, quite different things, depending on context and intonation. There seems to be no rule that enables a foreigner to distinguish these two different meanings. Are there any other words that mean one thing and the opposite? Post courtesy of my brother Owen – a Brit. 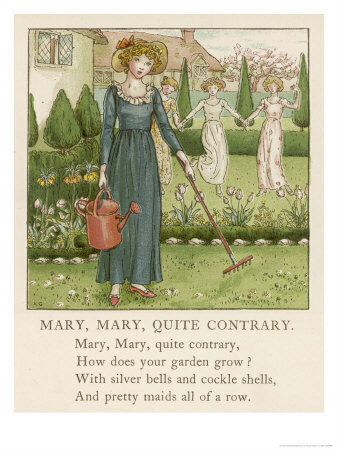 Was Mary very contrary, or just a bit? This entry was posted in Grammar, Words, phrases & expressions, Yanks vs. Brits and tagged ambiguous, British American words, quite, quite in British and American meaning, quite meaning on September 6, 2017 by Louise.